Join our community-driven Facebook group to arrange games, get involved with events or interact with other members of the Sanctuary Gaming Community! 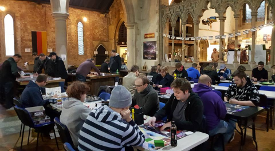 Sanctuary Gaming Centre was established in 2013 and has a vibrant ever-growing tabletop gaming community. We have busy weekly gaming nights for people to arrange pick up games and host regular gaming events, enabling gamers of all ages are able to play any system of their choice. Light snacks as well as hot and cold beverages are also available on site.